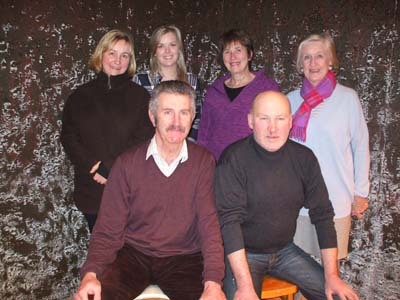 The cast of Skibbereen Theatre Society’s production of the darkly-comic Family Plot, which opens at Skibbereen Town Hall on Wednesday next, February 25th – back, from left – Angela Galvin Isobelle Nealon, Carmel O’Driscoll and Catherine Field. Front: Fachtna O’Driscoll and Ger Minihane. Stephen’s Day everyone is ready to run to the hills! ‘Family Plot’ is directed by Hilda Hegarty and Fachtna O’Driscoll.